So, spring is almost over, summer’s almost here – I am super late with my tags, so I am finally going to do The “Spring as Sprung” Book Tag before it is too late, which I was gratefully tagged by the awesome Orang-utan Librarian! Thank you! This should be fun! Flowers: Look on your bookshelves. What is the most beautiful book both inside and out? The Martian!!! I can’t get over the shimmery mix of orange and red and just the general beauty of it. Also, it is one of my all time favourite books, so there’s always that. Where is my real life Watney? I am still waiting for you dude! Grass: What is a book that you find that others like way more than you do? It’s not that I don’t like the story itself, but somehow I couldn’t connect to The Perks of Being a Wallflower all that much, even though I feel like it is a modern classic and a must read and everyone loves it. Rain: What’s a great book that lifts your spirits when you’re down? I’ve said it a couple times now, but Inkheart is just that amazing and I loved it and cherish it still. I don’t even know how old I was when I read the book. It was probably 10 years ago, but I will never dislike a book that was practically a love letter to readers. Dew: What’s a book that made you feel alive? My answers are so boring, but Red Rising definitely made me feel alive. My emotional range in real life has its ups and downs, but I felt some deep emotions with that book, things that I don’t usually feel – it was so exhilarating! Storms: What’s a book that you found unpredictable? Darn it! I used a good answer for this one for the previous question. Well, what else was unpredictable? We Were Liars kind of threw me a loop there. It’s not even that it was the most original or shocking thing ever, but I was so into the story, reading it through the course of a stormy afternoon that I simply didn’t notice it coming up. Rainbow: What was a book that you struggled with, only to be happy that you read it in the end? The entire Magicians trilogy made me feel so weird. I did not like those books, but in the end they stayed with me and I couldn’t forget about them. So, I don’t have regrets, even though I am still hesitant to ever recommend it to others. Chilly Weather: What’s a book that you couldn’t finish or didn’t enjoy? I always try not to DNF books, but at some point I get impatient and put them on hold and then … well, in most cases I forget about them and they remain on my shelf unfinished. I could not get through Winter’s Tale. Which still makes me sad, but that writing was so full of description and metaphor and I just couldn’t do it. Warm Weather: What’s a book that you loved and wanted more of? I guess Kindred Spirits is the perfect candidate for this one. I loved it immensely, because it just felt so true to my life in many aspects and like a story I could truly relate to and then it was over. Like a teaser for a movie but never the whole thing. Green: What’s a book that you haven’t read yet, but really want to? The Unexpected Everything! It is sitting on my shelf and taunting me, but SOON! I would never pass on a chance to read a Morgan Matson book. Pink: What’s a book in which you felt a strong connection to the characters? One of the characters I could really connect to was Emily from Since You’ve Been Gone. I’ve mentioned it before in a post with characters that matched my personality, so yeah, that’s still true. Purple: What’s a book that when you read it, you feel safe? Safe you say? I honestly don’t know, usually books spark my wanderlust, my urge to do something more with my life than I am currently doing. They get my imagination started, make me yearn for magic and foreign lands. For the love and friendship of fictional characters. But safe? Not really. Sorry for such a non-answer. I will probably be able to think of something as soon as the post goes up. Orange: What book do you feel is intelligently written? I don’t know why exactly this is coming to mind now, but The Disreputable History of Frankie Landau-Banks was one of the first books that came to mind. I feel like YA is an underrated genre in terms of being intelligently written, so I am choosing that book instead of some classic. Yellow: What book puts a smile on your face? 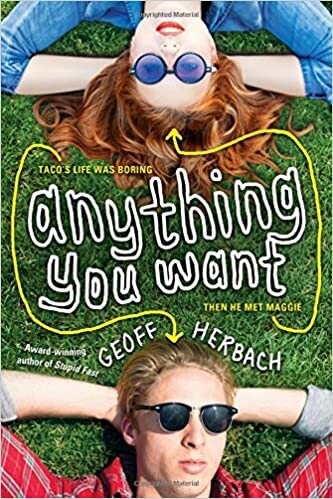 Anything You Want was downright hilarious until it had me sobbing of course. But before that – laugh-out-loud funny! Since I was so late and I really have no clue who already did this tag, I tag everyone who wants to do it! This was a fun tag to read! I also love The Martian and found Read Rising exhilarating! I am also trying to get to The Unexpected Everything! Soon enough. Thank you 😀 glad you liked it! Feel free to do the tag yourself if you want to. I am going to buddy read The Unexpected Everything with a friend and am so excited. Here’s to hoping she’ll get her copy soon! I am with you on The Perks of Being a Wallflower. I think it’s really overrated. Wohoooo! I always felt so alone with that opinion. I definitely have to agree with you about YA being an underrated genre. YA books can be as brilliant as some classics everyone praise. 😀 I really liked the Lockhart book you quoted for that one. Frankie was one crazy main character! People keep underestimating the universal appeal of YA while these books still manage to cover some serious topics. I really liked Frankie’s story, but I wish she hadn’t been basically alone in the end. That just made me kind of sad. Exactly, and that annoys me so much. There are days I want to scream about how good those books actually are! I totally get it! The shop I work at has barely any YA or contemporary books and I get so frustrated. People want me to recommend something, but we literally don’t have any of my favourite books. Oh I get that frustration so, so much, it happened to me plenty of times as well when I interned in bookshops. Even now, sometimes I’m thinking talking about YA books where I’m working would be a nice change, but I feel like people would just look down on me and my taste. It annoys me how people associate YA with Twilight and “bad” books, when that’s not the case, at all! I wish I bought a hard copy of The Martian, I love the US cover so much *A*! It is SO beautiful. I have the paperback version, but if I had the hardcover, I am not sure I would ever look at anything else. I adored The Disreputable History when I read it a few years ago. I definitely agree with you about it being intelligently written– it’s a story that really made me think about a lot of things. It’s such an underrated novel! It’s definitely on my summer read list, I want to know what makes it so great and fun! I hope your expectations aren’t too high for now. But I think it was excellently researched and I never would have believed that it was self-published at first. Weir did a great job with this one. I do my best to keep them low but they never listen. Anyway, I told myself I would not like it so it should be fine. I am not expecting much so that I can keep an open mind. I did not know it had been self-published. It’s impressive. That’s a good way to go about it. I actually thought that I wouldn’t like it either and it took a while until I truly got into it. That’s maybe one advice I would give, don’t quit too soon. That book deserves some buzz! So glad we think alike on so many of my answers and I am still SO happy that you read the Red Rising books! aww thanks!! I’ so glad I followed your advice! !